What about that 1970's ice age? A good friend posted this link to FB. I read the post, did some background reading, and debated whether to write this post or not. I’ve been writing it in my head anyway, so time to get it out! I’ll preface my remarks by pointing out that I am not a climate scientist. I am an educated observer. Regardless, Stephen spent many hours explaining conservatism and the bible to me, so I owe it to him to try explaining this! I do care about climate change, both personally and as a driver of ecological systems which ARE my expertise. In the article Bill Mundhausen makes three statements worth thinking about. Eventually I’ll go through each of these individually. This post will just address the first one. This is something I’d heard before but not pursued. This statement is often thrown about as evidence that climate scientists don’t know what they’re talking about, or that they change their minds to suit the prevailing political climate, or that things go up and down anyway so why worry? 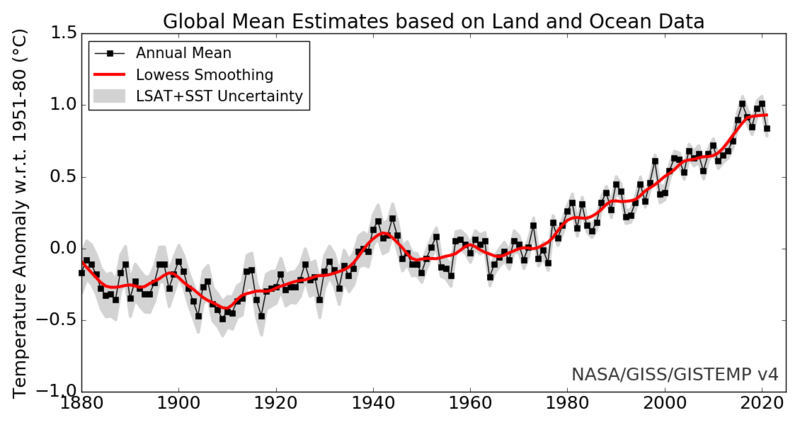 It’s true that the global temperature trend flattened out or even decreased during the middle of the 20th century. So did that have climate science predicting an ice age? This time I resolved to figure out what was going on. There is an awesome collection of scanned news articles here, and a similar list with references here. With a couple exceptions on the first page, these are all media stories, not peer-reviewed publications. A new ice-age made good headlines at least! What were scientists writing at the time? There’s a good summary here, including a reference to a peer-reviewed review of the science at the time. Between 1965 and 1979 7 published articles predicted continued cooling. But 42 articles predicted warming! And over 20 articles predicted no systematic change would occur. Scientists were genuinely uncertain about the future of the climate at the time. Part of the reason for the uncertainty had to do with a lack of understanding about how two distinct human drivers of climate would interact with each other. On the one hand there were the first decades of evidence that atmospheric $CO_2$ was increasing. On the other hand there were observations of dramatic increases in aerosol emmisions, particularly $SO_2$. Remember acid rain? The same chemicals responsible for acid rain also have a cooling effect on the atmosphere, and those emissions were dramatically increasing in the early 70’s. So the scientific uncertainty reflected these competing drivers. $CO_2$ warms the lower atmosphere, while $SO_2$ cools it. The scientific articles predicting a new ice age were forecasting the impacts of continued increases in $SO_2$ (see this scan ). Humanity acted to limit $SO_2$ emissions which began declining around 1980. We acted on $SO_2$ because some impacts were more obvious (decreasing pH in surface waters), and the economic costs smaller than reducing $CO_2$ emissions (although still substantial). So overall the “ice age scare” was a media construction at a time when political discussions were focused on $SO_2$ emissions. It would be interesting to see if those debates stimulated climate scientists to focus more on building long term data records, and to use those data to measure the effects of human and natural drivers on climate change. The available data in the 1970’s were quite limited (see figures at the top ). At that time climate scientists also lacked the most powerful tool for understanding the interacting effects of climate drivers: computational models of the global climate system.